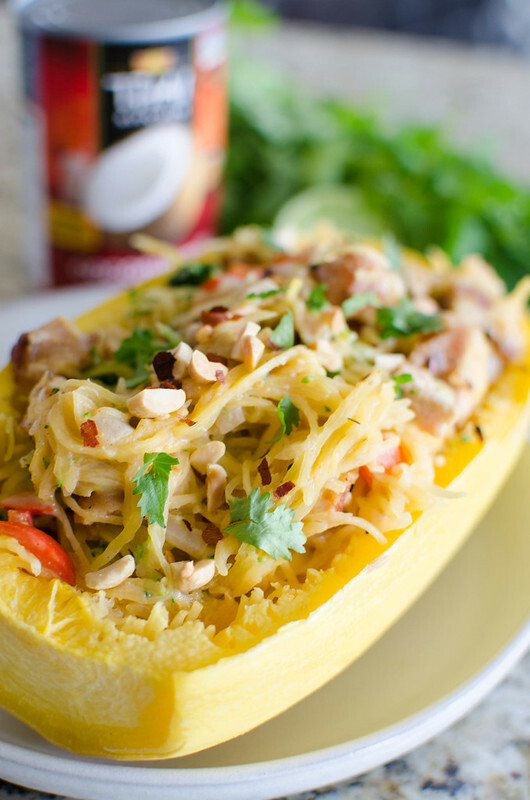 Thai Peanut Spaghetti Squash – chicken, broccoli, and bell peppers stuffed in a spaghetti squash and coated in a sweet and spicy, creamy peanut sauce. Low carb and dairy free! New year, same obsession with spaghetti squash. For, like, a month I had moved onto delicata squash but I’m back to buying 5 spaghetti squash a week and then getting overly excited when the grocery store cashier asks what I’m going to do with them and telling her all the ideas I have for squash. It’s fine. It just means I get to share delicious recipes like this with you guys.